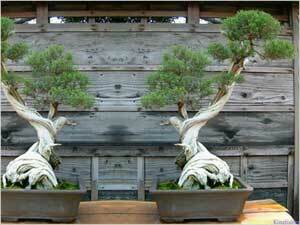 The Japanese word Bonsai, literally means  planted in a bowl or planted tree miniature in bowl. The milinnea-old art of horticulture has evolved into a new form, where tree and pot forms a single harmonious unit. The technique involves dwarfing of trees and plants and developing the miniature into an aesthetically appealing shapes. Proper care, regular pruning and training them into containers are the basics of the living art. Bonsai is a great hobby, you can also choose it as a profession. Experts say it is 90% art to a meager of 10% horticulture. A successful bonsai is a masterpiece created over time with much efforts and creative aspirations. If you are interested in pursuing the art, just get started by taking few baby steps. As a beginner, all you need is a Bonasi sapling from the nearest nursery. Choose plants that are hardy like evergreen varieties or species of bamboo. Always opt for one with sturdy trunk and plenty of leaves. You should have an idea of what your plant should like, since you will have to mold it accordingly. Find a suitable Bonsai pot for your plant. While selecting the right pot, remember it should be large enough to accommodate enough soil that can cover the root. It should have a heavy base so that it can support the plant, even after it has grown to its full bloom. The secret of preventing the plant from growing at its length is to cut the roots. Before planting the sapling, cut one-third of the roots. Begin from the tip of the root and specially focus on the thicker roots. Also trim the fine feeder roots. Feeder roots are slender roots that penetrate into the soil and provide most of the nourishment to the tree. Besides cutting the roots, you will also have to prune the plant at regular basis to give it a desired shape. Use pair of pruning shears to perform the task with much required precision. The beauty of Bonsai lies in its voluminous trunk, hence cut all the branch from the lowest part of the sapling. This will give the plant an aesthetic appeal. Middle section should have few branches extending in different directions. The top section should have multiple short branches with visible apex. The apex will form the pinnacle of tree. Once you are complete with pruning and adjustments, place the sapling in the pot. Make sure that roots are covered properly. Potting can be done using the soil from your garden, although Bonsai dirt is preferred by the expert gardeners due to its drainage property. You can also use pot hangers to highlight the beauty of your bonsai plant.